Director of Dear Comrade, Bharat Kamma, denies these reports and says the two films are different from each other. Vijay Deverakonda’s one of the upcoming films has been titled Dear Comrade which will be directed by newcomer Bharat Kamma. Said to be an intense drama, Dear Comrade was announced on the eve of Vijay’s birthday. 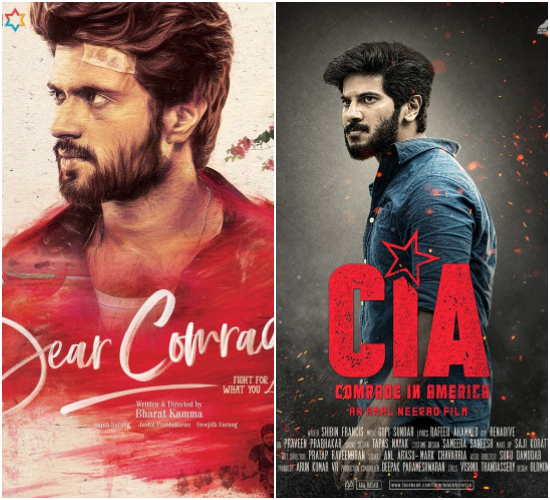 However, the title Dear Comrade has led to speculations that the film could be a remake of Malayalam hit film CIA: Comrade in America which stars Dulquer Salmaan and Karthika Muralidharan in the lead role. But the director of Dear Comrade, Bharat Kamma, denies these reports and says the two films are different from each other. “Our film is not inspired from the Malayalam film. It is a different project,” Bharat Kamma was quoted as saying by Kochi Times. CIA: Comrade in America was the story of a young man who travels to the US in search of his lady love which was played by Karthika Muralidharan. Interestingly, Vijay Deverakonda and Dulquer Salmaan have acted in Mahanati, which just released, however, they don’t share any screen space in the biopic on iconic actress Savitri. While you’re fighting for what you love, Here’s wishing you a happy birthday. So glad that I’m a part of this project. The makers made the announcement on the occasion of Vijay’s birthday which happens to be today, May 9th. Vijay made the announcement in his own style and wrote on his Twitter page – “Mythri Movie Makers. Big Ben Cinemas. & Your Man @Thedeverakonda. Bring you an action drama you will not forget – #DearComrade directed by Bharat Kamma. Shoot starts this June.” As confirmed by the Arjun Reddy actor, the shooting of Dear Comrade will commence from June this year and the release date of the film is yet to be locked by the makers. Bring you an action drama you will not forget – #DearComrade directed by Bharat Kamma.